Andulucia\'s capital, Seville is also the cultural and financial centre of southern Spain. With a metropolitan area of 1.6 million, Seville is Spain\'s fourth most populous city. It sits on the banks of the Guadalquivir, at a strategically significant part of the river, and Seville has been an important port for goods coming in from east and west. It was a vital trading post under Roman and then Muslim rule, but commerce truly exploded as the city cornered the emerging New World market in the 16th Century. Over the next three hundred years, it became known more for its splendid architecture and culture, and was a stop along the Romantic \'Grand Tour\', the educational rite of passage undertaken by the young and wealthy of Europe. Seville has perpetuated its reputation as a major cultural centre throughout the 20th Century, playing host to the International Exposition in 1992, an event that prompted a surge of modernization including the much-hyped bullet train link to Madrid. Today, Seville is renowned for its first class tourist facilities, cultural diversity and thriving nightlife. Seville is a true competitor on the world stage of great cities. The 15th Century cathedral was once the third largest in the world behind Rome\'s Saint Peter\'s and London\'s Saint Paul\'s, and is well worth the 8 Euro entry fee. 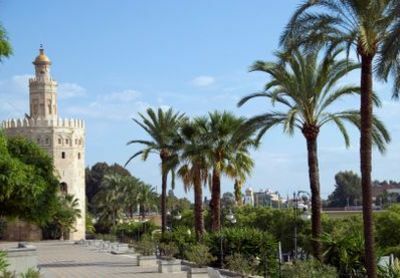 La Giralda is a stunning minaret, once part of the chief mosque but since opted by the Cathedral. It offers magnificent views across the city – well worth the climb. Football fans will want to check out the Sevilla FC stadium next to Plaza Nervion. If you find yourself there during the football season, the club regularly lets people in to catch the last five minutes of the game for free (unheard of in Britain) which is a great way to experience the unique passion of Spanish sports fans without trying to get hold of tickets. Seville\'s open air markets are some of the best in the world – the trashier the better. Try the flea market just northwest of Triana near Avenida Carloss III. As with most major Spanish towns, the nightlife is first class, and Seville purports to have more bars per capita than any other European city. The 24h Seville Card is strongly recommended as a way to save money on everything from transport to museum entrance fees. The centre of Seville is best explored on foot. The architecture is so gorgeous, the city is a real \'living museum\'. But there is much to see and do in the rest of Andalucia, and no trip to the region would be complete without escaping the urban area and exploring the countryside by road. If you\'re looking for affordable car rental, Seville is well served by GoCarRental.com, which offers a wide variety of vehicles. Pick the car up at the airport, spend a few days parked at your hotel in Seville, then escape for a day and a night to explore Andalucia by road.